Beat brain drain this summer with kid-friendly fun and eco-adventure in Daytona Beach. Offering a variety of eye-opening, educational opportunities, the area provides students of all ages unique ways to explore historic sites, engage in science museums, connect with nature and disconnect from everything else.Here on the Original American Beach, our sandy classroom is sure to keep curious minds entertained all season long. Take a trip to Blue Spring State Park for an action-packed day of ecologic learning that’s beyond textbook. Plunge head first into an underwater world of native Florida fish and playful otters with a swim to the park’s spring boil. 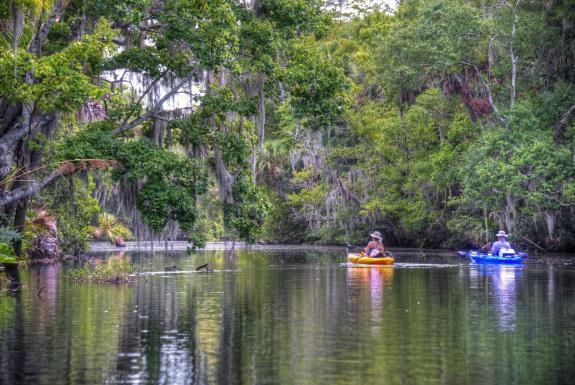 Brush up on flora and fauna with a boat tour across the St. Johns River. Explore interpretive exhibits at the site’s historic Thursby House. Then, paddle through the spring’s scenic wilderness with a canoe or kayak excursion. You may even get a lucky visit from the park’s most famous local, the West Indian Manatee. If saltwater dwellers are more your style, the Marine Science Center is the perfect place to explore the secrets of the sea. Pull up a seat at the center’s classroom laboratory where lectures and labs are held multiple times a month covering subjects like Shark Biology, Introduction to Birding, and Squid Dissection. Afterwards, get your hands wet – literally – at the stingray touch pool featuring the cownose stingray. The science center also offers other exciting, interactive attractions including a 5,000-gallon live reef aquarium, a seabird rehabilitation Sanctuary and Observation Tower, a fully-accessible nature trail and more. After the sun sets, take your learning opportunities above sea level inside Florida’s tallest lighthouse, the Ponce de Leon Inlet Lighthouse & Museum. Ascend 203 steps as you journey into the past for a unique history lesson of this National Historic Landmark. For an intimate and informative experience, try the Climb with the Keeper Tour where guests are offered a personal tour from an old lighthouse keeper including special entry to the tower’s Lantern Room. This summer, immerse your family in discovery when you plan your educational vacation to Daytona Beach. Revel in Daytona Beach art and culture in this “Blast from the Past” video!